Here is another post in series about React. This time I’m exploring Redux. I assume you know what Redux is already (otherwise, read redux.js.org to learn about it). 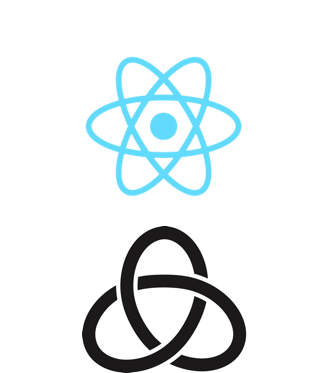 If you haven’t read my blog post Creating multilingual website w/ React & Flux - I’d recommend you go through it, because I will be doing exactly the same thing here but using Redux instead of Flux. I’ll use ES6 where it is suitable, I automate dev process using Gulp. The main purpose of this project is to get my hands on Redux, thus the output is not that important, but you can check the result here. This is how it looks. Two menus: left and right - left scrolls to different anchors in html, the right menu switches the language. To view a result on your local machine, just open index.html from react-redux-example/dist folder in a browser. I use Visual Studio Code as my IDE. For development tasks such as run tests, build, deploy - I use gulp, you can check my tasks configuration in react-redux-example/gulpfile.js. On my website I want to show the content in three languages. I have created data/content.json file to hold the text in structured form so I could manipulate it easily later. This is my simplified ‘database’. To retrieve data from my ‘database’ (I mean from my json) I have created a fake API function in api.js. Later on I’ll just call my API to get data. It is as simple as this: This is the place you should put a call to your real API or database to retrieve your actual data. My UI consist of very few simple components: it’s a couple of containers to show text and a menu to navigate through that text as well as change the language of the text being shown. For that I have created 4 React components: Menu, About, Home and Page. In the picture above, you can see my components tree. Home and About components are only for information display purpose, they do not have any logic inside, they just get data through props and simply show it. Menu component also gets content through props, but in addition to that, it gets the function that should be called on language switch. To bring these components together I have a wrapper component Page. 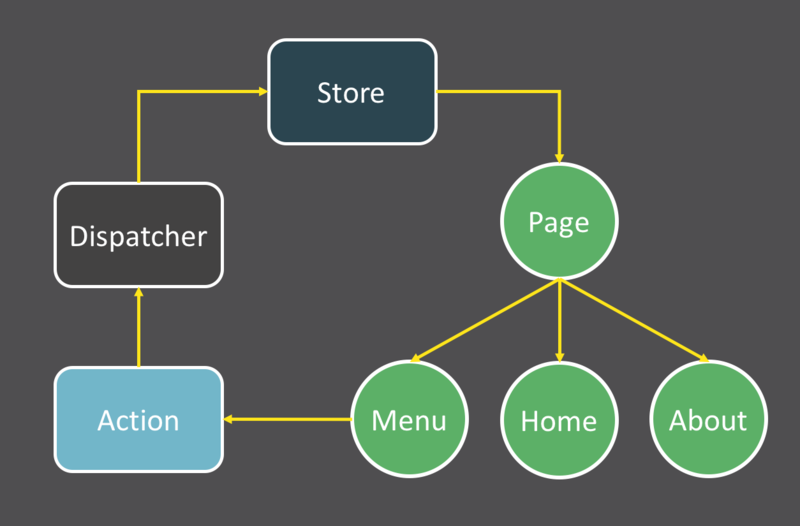 It’s job is to create Home, Menu and About and pass correct data to each of these components. Page itself gets all the content it shares to child components, through props as well. I’ll show code for the Page in Step 5. Redux. So I have a very simple almost empty index.html with a placeholder div page defined, which later will hold my react component. Finally, I have a app.jsx file. The content of which I’m gonna explain in the next step (Step 5. Redux), since it involves Redux. Basically in this file I render my Page react component into my page div and pass data to it. After all preparations are done, we can move forward and start with Redux. 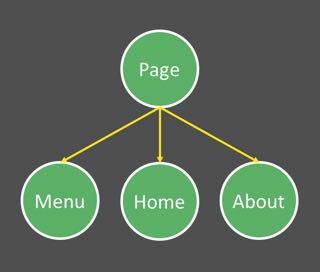 This is what I want to achieve: when new language is selected in the Menu component, action is invoked and the state is changed (to hold a content in different language) and the new content from a state is being passed to Page and from there down to all children. Here is how I would do that using Flux. The flow looks similar when using Redux with some differences: Flux Store’s role is covered by Reducer, there is no Dispatcher and no support for multiple stores in Redux. Let’s map this diagram items with my code. Then, in reducer.js file I have defined initial state named initialState for my app - it holds a text in default language (English) retrieved from my database. And I have a function named reducer, that returns me a new state according to the given action. So if reducer is called with switchLanguage action as a parameter, it will return me the content of the page in a language provided as a property in action. Now we have an initial state of the app, the description of state’s mutation (action) and a function to handle this mutation (reducer). Let’s move on to the presentation part. And the final part of this puzzle - Page component, which is ‘connected to store’ and gets the store from Provider. As you probably have noticed, in my app.jsx when creating Page component I do not pass any props to it, only to Provider, but inside the Page I refer to props. This is enabled by React-Redux: from one side, in Page I have connected Page to store using connect() function, and in app.jsx I use Provider, which actually pass store to my Page. The trickiest part for me was the usage of connect(), it does both: makes your component subscribed to store updates and handles dispatching for provided function. 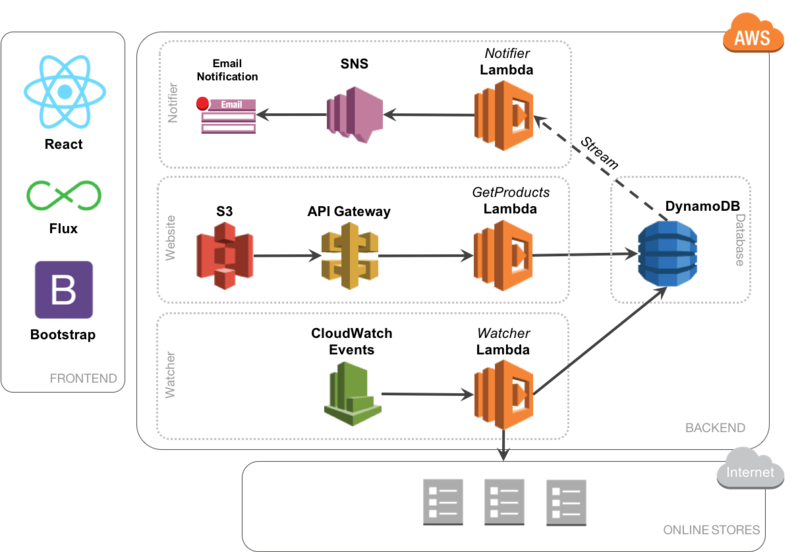 This post is about my most recent freetime-killer “DIY project” - Price tracker, which has a beautiful serverless architecture that I want to share with all of your. So I’ve developed a system, which tracks price changes for my desirable products in online stores (which I trust to buy from) and notifies me over the email when price drops. In addition to these parts - there is a database to hold all my products, shops and price changes. The sources are in Github at LenaBarinova/PriceTracker. Now shortly about how I implemented each of my three major system components. My Website - is a quite simple Single Page Application done in React using Flux pattern to handle UI changes. Website gets information about the products via a REST API implemented through AWS API Gateway, which calls AWS Lamdba function (written in Node.js) to actually get data from database. I use DynamoDB as a database, storing all of my products as JSON objects. UI is built using Bootstrap and some more advanced css styles to create flipping cards effects for products. Watcher is AWS Lambda function implemented in Node.js. It queries a database, gets all the products and runs scrapers for each product to retrieve a new price from online stores. Scraper function is specific for each store, it loads shop’s html and gets/parses price fields using jQuery selectors. If there is change in price - product is updated with a new price and persisted to DynamoDB. Watcher is scheduled to run every 4 hours using AWS CloudWatch Events. One more AWS Lambda function which listens to events in DynamoDB and if there is a price decrease - it sends email notification using AWS SNS service. Though it’s nice not to have a server and run everything on different services, and Lambda is a kind of magic, there are some drawbacks to it. In my case it’s perfect for Watcher and Notifier, but not that good for a data retrieval from DynamoDB. The problem is that in order to run Lambda function there is a lot of work done in the background (container creation, environment configuration, etc.) before actually running my function, that takes some time. When the task is a background job - it’s totally fine, but with UI - it gives me undesirable lag before loading my products for the first time. I don’t worry about it now, because I’m the only user of this system and visit this site once a week or so, but if someday there is more users than me, I’ll definitely look into it and refactor this part of the system. Besides this small issue, everything else works as a charm. And with deployment automation - it is a real pleasure to work on this “project”. P.S. : If you want to hear more about any part of this system - just leave a comment. And if you by any chance would like to try PriceTracker yourself - let me know, I’d be happy to set up it for you. 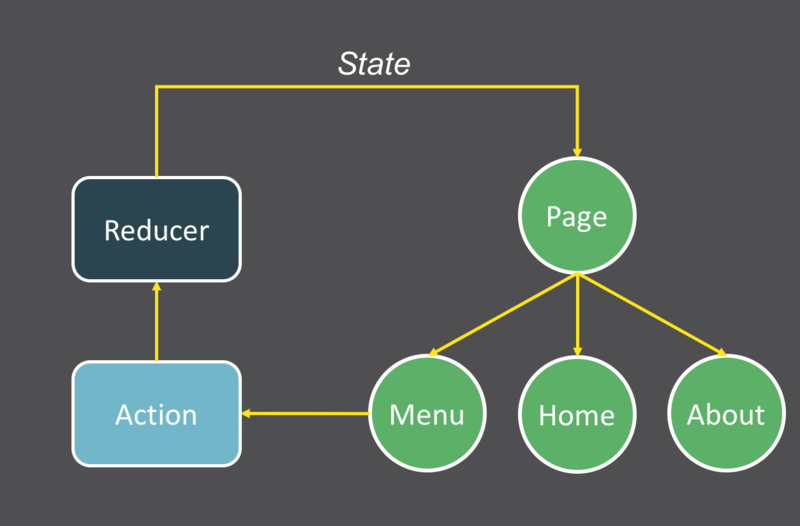 This is a continuation of Getting started w/ React & Mocha blog post. Here I’ll shortly describe one more alternative how to test a React component. If you are using Visual Studio Code - you can build it using ⇧⌘B (on Mac). In my previous post to test it I was creating fake DOM using JSDOM library and then rendering my testable component into this fake DOM (Read more about it here). This time I’ll only use React TestUtils add-on and rather new feature of it - Shallow Rendering. Shallow rendering is an experimental feature that lets you render a component “one level deep” and assert facts about what its render method returns, without worrying about the behavior of child components, which are not instantiated or rendered. This does not require a DOM. Testing using Shallow Rendering is faster. You can even notice it on this small example: my test using fake DOM runs for ~50ms, while using Shallow Rendering test takes only 10ms. I believe the gain is even more significant on big projects. And as a pleasant side effect it doesn’t require additional libraries.